The group setting in Ucloud is a very flexible tool to manage incoming calls. It allows you to route calls to specific users as well determine failover states if the call cannot be answered. To access this, hover on settings and click “groups” on the drop-down. To create a group either click the add icon or the “Add new group” button at the bottom of the list. This will open up a new screen for the group settings. You are required to choose a name for the group and have at least one member for a group to be active. When selecting group members a list of users will be displayed. Click the radio button to select users and click OK.
Group Broadcast turns on the speaker of all phones and is useful as a tannoy system. Here you can determine the manner in which phones will ring in the group. Simultaneous – All group members will ring at the same time. Progressive – The phone of the first group member will ring. Then after the slip time has elapsed the second group member’s phone will also ring. After another slip time period the next member of the groups phone will also ring. This will carry on until the all phones in the group are ringing or the call is answered. Progressive with shift – As per progressive but with the first recipient of the call being the next person in the group list. This will move down the list with every subsequent call. Cyclical – Rings the first group member. Then after the slip time has elapsed it will stop ringing and the second group member’s phone will ring. After another slip time period the second groups members phone will stop ringing and the next member of the groups phone will ring. This will carry on in a cycle until the call is answered or the max ring duration expires. Cyclical with shift – As per Cyclical but with the first recipient of the call being the next person in the group list. This will move down the list with every subsequent call. 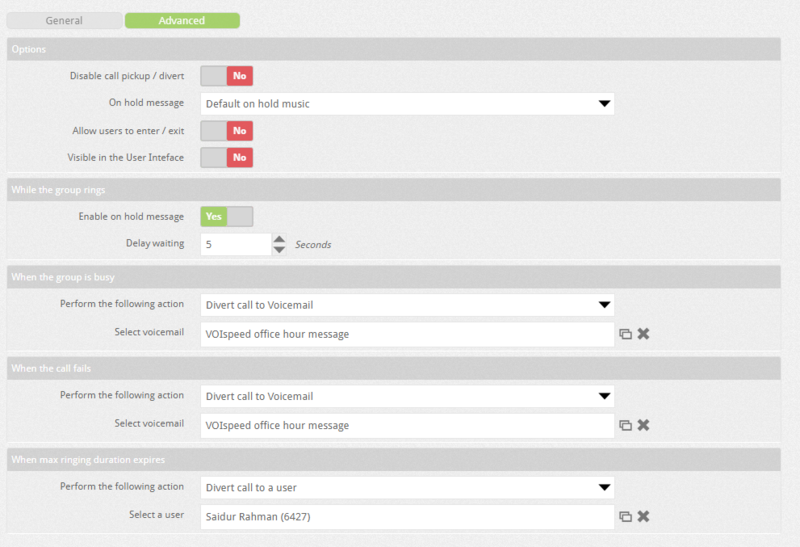 Automatic call queuing – All calls are put in queue and are visible on the UI for the user. Users can then chose which call to pick up. Slip time – With progressive and cyclical, this is the interval between the next group members phone ringing. Max Ring Duration – This is the time the call will ring, after which it will carry out the action setup in advanced settings. Disable call Divert – If enabled group users will not able to divert calls. Diverting calls whilst in a group will result in all group calls being diverted (e.g. if a user diverts calls to their mobile, all calls to the group will go to the mobile and the mobile’s voicemail may start when activated). On Hold music – this can be the default or a wav file can be uploaded to the PBX. Allow users to enter/exit – The Ucloud UI allows groups to be joined or exited by users. Visible in the User Inteface – The option to make groups visible in the Ucloud UI can also be turned on or off. Enable on hold message – Choose to have caller hear ringing or on hold music. The below routing rules can be applied to each state. Reject call: On by default. Playback Message: No default, a message must be provided by the client for this to be used. Divert call to a user: All calls are diverted to a specific user. Divert call to another Group: All calls are diverted to another hunt group. Divert call to an IVR: All calls are diverted to a responder. Divert call to Voicemail: All calls diverted to voicemail. Divert call to a number: Divert call to specific number. Send call anyway: Caller will hear busy tone. Join Queue: You can also chose whether to notify the caller of their queue position and whether the call should exit after max ring expiry. On the general group management page the button, allows you to create multiple groups at once thereby shortening the configuration time and reducing repetitive actions. Create group by department – creates a group of users belonging to the same department. Users must belong to a department for this to take effect. Select the users that you want to create the group . For each of them a single user group will be created . It will be possible to apply the desired settings as a group (General and Advanced), and it will also be possible, through the Routing section , to automatically create routing rules for incoming external calls to each of these groups, avoiding all the burden of doing so individually. The routing rules created will ensure that if an external call is directed to the user (in case of pass-through selection), the PBX will forward it to the single-user group. The routing rules also allow you to specify a working time table and possibly a prefix. At the end , an implicit (therefore invisible) rule will be created for each mono-user group , which will route the external calls for the user number directly to the group in question. The purpose is to simplify the creation of management rules for a pass-through selection when users are to be managed as groups.